As a teenager who was vocally opinionated about political issues, I often heard the cautionary refrain “Politics is not the topic of polite conversation.” That counsel must have been lost on me, since I find myself as an adult publicly airing my opinions as both the political correspondent for this blog and as a Democratic analyst periodically appearing on FoxNews.com. I understand the wisdom of that advice, however, and know that conversations about politics (like those about religion) often begin as well-intentioned contests of ideas but end as emotionally charged and intractable disputes. A new study released today from the Pew Internet and American Life Project illustrates this point. 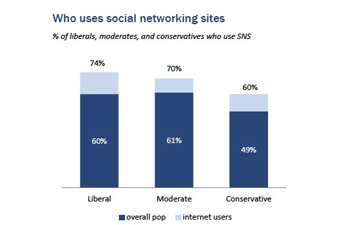 It found that 18 percent of people who use social networking sites such as Facebook and Google+ have blocked, unfriended or hidden someone because of that person’s disagreeable political postings. What is surprising is that nearly one-third of the people that have blocked, unfriended or hid someone in response to political posts did so to a close personal friend." Aversion or the end of meaningful conversation? To determine whether this is simply a case of the online public steering clear of, um, impolite conversation or is broader evidence of political opinions abruptly ending meaningful relationships, one must dig a bit deeper into the data. Among the people who’ve responded to unwanted political posts by giving an online cold shoulder, nearly 70% have done so to a distant friend or acquaintance. We all have a few of those Facebook friends with whom, after briefly meeting at a conference or dinner party, we perfunctorily became “friends.” It wouldn’t be a surprise that a disagreeable (or even distasteful) political comment on Facebook might serve as an excuse to shed some of these “friends” that we marginally knew to begin with. What is surprising is the fact that nearly one-third of the people who have blocked, unfriended or hid someone in response to political posts did so to a “close personal friend,” and nearly one-fifth of them did so to a “member of their family.” Considering the old saying that someone with staunchly held political beliefs has “drunk the Kool-Aid,” can it really be the case that, online, Kool-Aid is thicker than water? Are we really shunning close friends and family members because of differences of political opinion? Cass Sunstein, now President Obama’s regulatory czar, has pointed to a phenomenon of cyberbalkanization in which, online, people read articles and associate with others who share their political opinions. Sunstein’s research demonstrates that, in the online echo chamber, people’s beliefs aren’t just reinforced but actually made more extreme (on both the left and the right). Should We Leave Networking at Social? Perhaps social networking sites are best left to, well, social networking — and the political debating should occur elsewhere. This is the approach that nearly a quarter of users of social networking sites take. According to the Pew report, 22 percent of those who use these sites “have decided not to post political comments or links to political material because they were worried it might upset or offend someone.” In other words, these folks agree with the advice I grew up with regarding politics and polite conversations. But for so many of us who are civic-minded and politically engaged, it would be hard to steer clear of political discussion online simply for propriety’s sake. On a recent appearance on FoxNews.com, I debated against the claim that there was somehow a double standard in the media’s portrayal of the outrage surrounding Rush Limbaugh’s recent controversial remarks (and that there was equivalence between them and similarly offensive remarks made by comedian Bill Maher). After I posted the link to the segment on my Facebook profile, a close family friend who’s been like a grandfather to me throughout my life, and who I know to have a more conservative political outlook than myself, shared a link that criticized Maher and reiterated the claim that a double standard was at play. My first reaction when seeing G-Pop’s message on my Facebook wall was appreciation for Facebook’s ability to keep me in touch with someone who’s been so important to me throughout my life. My second reaction, which I recommend to anyone struggling with political differences among friends and family on their online social networks, was to agree to disagree. multiple times and I’m pretty sure this is the reason. The strange thing is that those who are violently in opposition to my ideas verbally and argue have never un-friended me over this. It is only the ones who say nothing. That kind of makes sense though because they don’t disuses politics on Facebook and don’t like it when others do I imagine. I actually agree ironically. You’re a strong person for doing that. I’ve been an athiest for years, and have never told my family. It’s like having to “come out of the closet”. 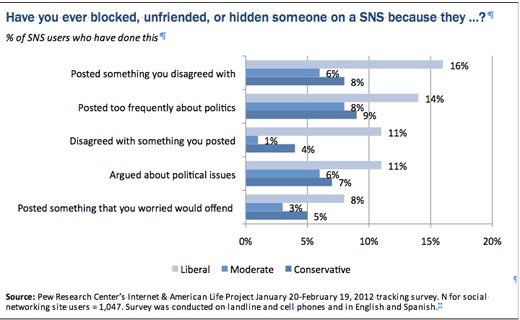 Notice from the chart that Liberals overwhelmingly do more of the “unfriending” than Conservatives and Moderates. This is not surprising to anyone who has regular interactions with liberals. They are the most intolerant group of people. A recent example was the Baltimore riots. Most of the liberal people in my circles openly stated that if anyone criticized the rioters, the critical people would be removed from friend lists. As a liberal, this saddens me. This closed-mindedness is particularly true of the social issues focused liberals, who don’t tolerate anything which doesn’t fit the radical feminist, pro-affirmative action, politically correct paradigm. Both sides are big tents with both bad and good people though, plenty of statistics exist which make conservatives look bad as well.